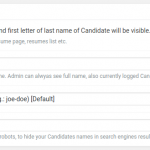 Use Candidate Anonymizer plugin to protect the candidate details from unauthorized access or from having them indexed in search engines. Some candidates do not want to draw attention to themselves or do not want to be found in Google or Bing search at all or even worse then they do not want their current boss to know they are looking for a new job. Help them to achieve this by installing the Candidate Anonymizer plugin. 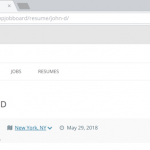 With just a few clicks hide candidate surnames from unauthorized access and disallow search engines to index the candidate details pages. Anonymous page title, browser title, and candidate slug. Select how you want to anonymize the candidates. Hide candidate surnames from unprivileged access. 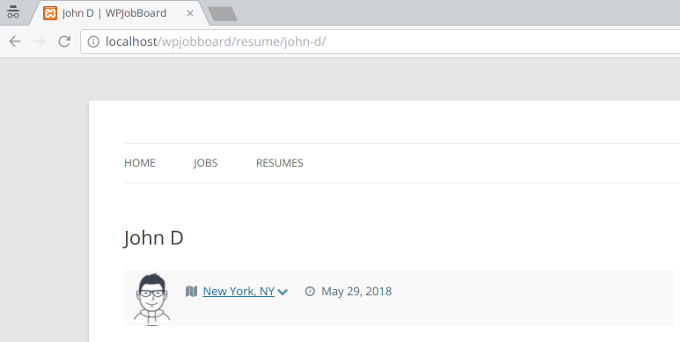 When viewing candidate details page hide the candidate name in the browser window, browser URL and in the page title. Disallow search engine bots (Google, Bing and etc.) to index candidate details pages. Login to client panel and download the Candidate Anonymizer extension. in wp-admin / Plugins / Add New / Upload panel upload and activate the Candidate Anonymizer downloaded from client panel. Configure privacy options form the extension from wp-admin / Settings (WPJB) / Candidate Anonymizer panel. Annonymous page title, browser title and candidate slug.